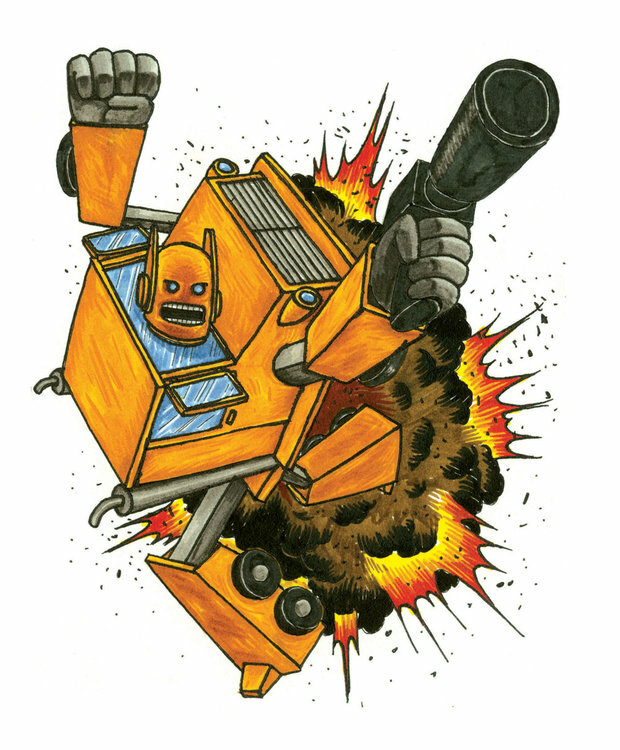 enraged leader of the Awesomebots, Big-Rig, a charismatic robot-truck, decides to start a "heavily armed peaceful protest" which ends up destroying the whole planet. To ensure their survival, the Fantasticons and the Awesomebots reluctantly work together to collect the scraps of their planet and build a spaceship. The rest of the book is about the run in's they have with humans and each other after they crash onto Earth. I like how ridiculous this spoof is. For example, when Shootertron forces a human scientist to build a new weapon to use against the Awesomebots, the scientist builds a paper box which "incredible changes" into a paper crane. Who would think of an origami crane attacking giant robots. Not me. The art in this book is very fun. It looks like a mix between something an adult would draw and a child would draw. Many of the books I review are colored with a computer. I am 99% sure that this book was colored with markers. The humans in this book have small round eyes and very pronounced wrinkles. The robots, for what they're worth, are drawn pretty simply. They are not nearly as detailed as the humans, but they're still pretty cool looking. The art is really just Jeffery Brown's trademark style. He drew the same way in the Big Head, an earlier graphic novel about a super hero who's power is that he has a big head, and the instantly famous Darth Vader and Son. As I already told you, this is a spoof of the Transformers cartoon. I, for one, have never seen the show, but I have heard that it's not very funny or self-mocking. Incredible Change-Bots, on the other hand, is hilarious and never stops making fun of how ridiculous its plot and characters are. The only similarity between Incredible Change-Bots and Transformers that I know of is that they both have transforming alien robots. This book is appropriate for all audiences. The violence is mild and most of the time, it's just slapstick. I enjoyed it when was younger, I enjoy it now, and I will probably enjoy it in the future. If you enjoy Incredible Change-Bots, there is a sequel that takes place where the first one left off. I would give Incredible Change-Bots 5 robot-microwaves out of 5. 5 robot-microwaves out of 5! This is high praise, indeed. Great review, Milo, clear, specific, and compelling. I read some Incredible Change-Bots years ago, now I want to read it again. Jeffrey Brown is the best, good on you for spreading the word. Once again, you’ve piqued my interest. Sounds silly in a good way, for instance the idea of a “heavily-armed peaceful protest.” The way you describe this book, it seems that it has a lot of fun pushing the limits of the spoof. For instance, the paper crane fighting the bots. And the art does have a different, kid-like look to it. I always enjoy your observations about the art. Yeah, I always prefer hand drawn stuff. And the zen thing of origami going to battle with the old clanking giant robots is sounds fantastic to me too. Way to go, Milo. Keep 'em comin' ! Another well written review. I will recommend this to my sons, who had a huge collection of transformers circa 1995. One of my sons got in trouble in Hebrew School for drawing the Maccabees as transformers (which I thought made a whole lot of sense) I think they would enjoy the "self-mocking" tone of this book. Having been through the transformer craze, from the toys to the movies, they would get the irony. I never even knew this gem existed! It's now on my must-check-out list! Great review!